Digital stamp or download questions? Why is it asking me to login? I've ordered here before but never had it ask this? Can I mail a check or money order directly to Bombshell Stamps? Is there a waiting period for e-checks through Paypal? Can you walk me thru the check out process? Where and how do you ship? I received an order confirmation without making payment!? I've received multiple order confirmations!? Why does it say "Monster Graphics" on my receipt? I purchased digital images, where are they? I never received my order!? I've received the wrong stamps, or stamps I didn't order!? What is the Bombshell Stamps Guarantee? You guys rock so hard, how can I show a little Bombshell love? For more answers to your Digital Download Questions click here! This is a new feature that has been integrated for your convenience! It will allow you to return without having to fill out your basic information again. If you purchase any digital stamp images, your login information gives you access to your personal account of purchased downloads. So be sure to remember your name and password, as we are unable to retrieve this information if it becomes lost. Yes! Just click thru the check out and you will have the option to either pay with your Paypal Account, or directly with your credit card. Although our checkout system is through Paypal, you do NOT need a Paypal account to make a payment. To pay directly with credit card, just click the "continue" link next to the credit card icons on the lower left side of the payment screen, as shown in the diagram below. This will take you to a payment page where you can enter your information in directly. Yes. When going thru the check out process, you will have the option to choose sending a check or money order. Upon clicking this option, you will be directed to a page with payment instructions, and address to send payment. Nope! Although our checkout system is through Paypal, you do NOT need a Paypal account to make a payment. To pay directly with credit card, just click the "continue" link next to the credit card icons on the lower left side of the payment screen, as shown in the diagram below. This will take you to a payment page where you can enter your information in directly. Yes! Please be aware, that when choosing the e-check option, we must wait approximately 4 days for funds to clear before shipping your package. This is ONLY when choosing the Paypal e-check option. All other methods of payment execute immediately, and your package will ship out right away. Click the "Check Out" button, and fill out your address for shipping options. On the next page, choose your preferred shipping method. Then click "Pay Via Paypal" button at the bottom of the page. Our checkout system is supported by Paypal, but you do not need a Paypal Account to continue. On the next page, click on the Paypal Icon. On the next page, you can: (a.) 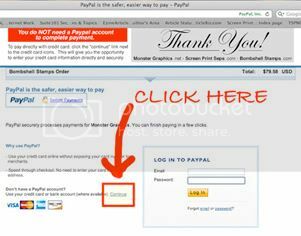 choose to pay with your Paypal account by entering your login information, or (b.) choose to pay directly with your credit card by clicking the "continue" button located to the right of the credit card icons, and shown in the diagram below. After making payment, you will receive a confirmation of "successfully completed payment ". Mission accomplished, and you'll be enjoying your new stamps in no time!!! We ship with the good 'ol United States Postal Serivce, and everywhere UPSP goes! Shipping USPS helps us keep our shipping prices as low as possible. Please allow 1-2 days for order processing. For mounted stamp orders please allow 2-3 business days for shipping. All mounted stamps are hand cut when the order is placed. Please allow 1-2 days for order processing. For mounted stamp orders please allow 2-3 business days for shipping. All mounted stamps are hand cut when the order is placed. A Bombshell Stamps order confirmation is sent as you click thru the check out process, before payment completion. This is not confirmation of payment, just your intended order. The final order is only shipped when payment is made, and you receive a "successfully completed payment" page confirmation. You will then receive another email with all your billing details. NOW your order is complete and ready to ship! If you abandon your order during check out, or decide to make some changes and start a new order, you will receive additional order confirmations. You can go thru this process as much as you like until you are satisfied with how your order looks. We only ship the orders that correlate with completed payments. Monster Graphics is the main company that started Bombshell Stamps. They are one in the same... me! So my Paypal account is used to collect payment for both companies. We've set aside an entire page dedicated to showing you how to access your purchased digital images and to answer any questions you may have regarding accessing, downloading, and printing. It's very important to us that you receive what you paid for, so please click here to view more information on your digital downloads! If you placed your order more than 3 weeks (21 days) ago, and still have not received your stamps, the first thing you want to do is check that you received a "successful payment completion" email. This is not the Bombshell Stamps order confirmation, but an email from the Paypal check out system. If you have been charged, and did not receive your package, please email us! We will follow up on your shipment, make sure you receive your stamps, and are completely satisfied! Since we ship thru USPS, your package must be missing 21 days from the shipment date before we are able to follow up on it. This goes for first class mail, AND Priority Mail packages. If you've received the wrong stamps, we will happily replace them! Double check your emailed order confirmation, to be sure what you received does not match up. Then, email us and we will walk you thru shipping us back the received stamps. Your replacement order will ship out as soon as the initial package is received. If you received "unmounted" stamps instead of "mounted" stamps, please double check. Remember, our unmounted stamps are just a single stamp sheet. The mounted stamps are individually cut out, and mounted on static cling foam cushion, (not mounted to wood blocks). We guarantee that your stamps will arrive in good condition, or we will happily replace them! Just email us, and we will walk you thru shipping us back the damaged stamps, and we'll ship out your replacement order right away. The best thing you can do is share us with a friend! It's OK, we don't mind being exploited! Post a little something in our guestbook. This reaches more like-minds than screaming it from the tallest mountain, but we appreciate either. Add a Bombshell Banner to your website or blog. We'd be happy to post a link to your website on our links page! Submit your Bombshell Stamp creation to our Art Gallery so all can admire. Then submit it to a rubber stamp magazine, and we'll show you our love by sending some free stamps your way! Demand that your local craft store stock Bombshell Stamps. All the neighborhood stampers will thank you~ what a local hero you will be!